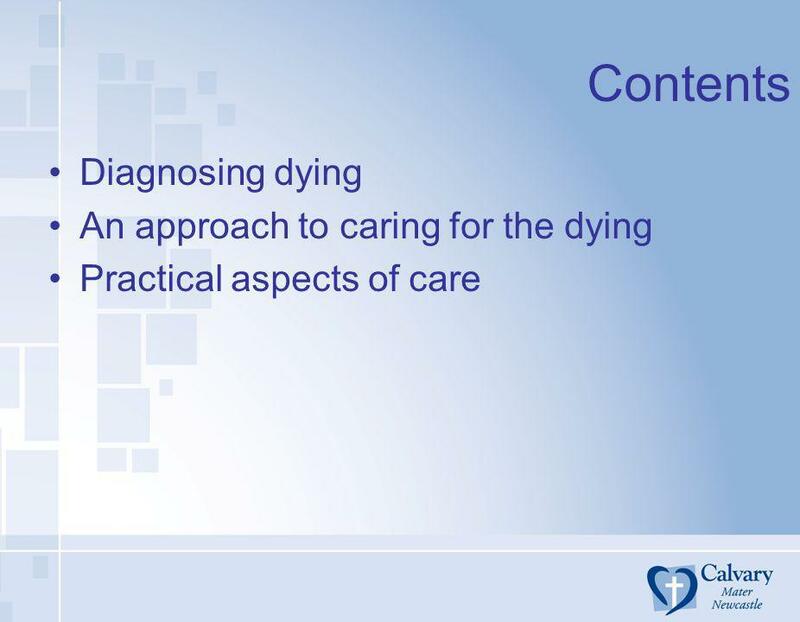 3 Diagnosing Dying In order to care for a dying person, it is essential to recognise and diagnose dying; This may be a complex process. In a hospital setting, where the culture is often focused on “cure,” continuation of invasive procedures, investigations, and treatments may be pursued at the expense of the comfort of the patient. There is sometimes a reluctance to make the diagnosis of dying if any hope of improvement exists and even more so if no definitive diagnosis to account for the illness has been made. 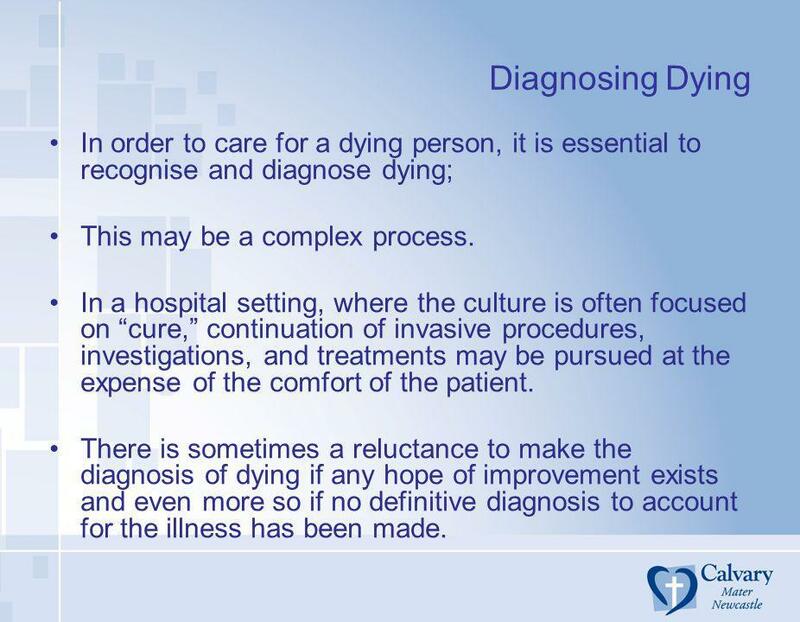 4 Diagnosing dying Recognising the key signs and symptoms is an important clinical skill. The dying phase for cancer patients can sometimes be precipitous—eg massive haemorrhage—but is usually preceded by a gradual deterioration in functional status. 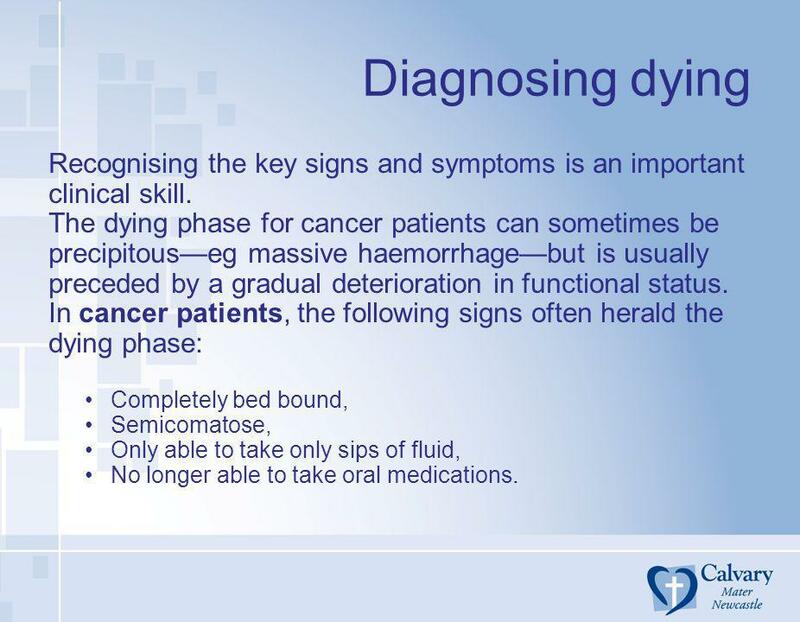 In cancer patients, the following signs often herald the dying phase: Completely bed bound, Semicomatose, Only able to take only sips of fluid, No longer able to take oral medications. 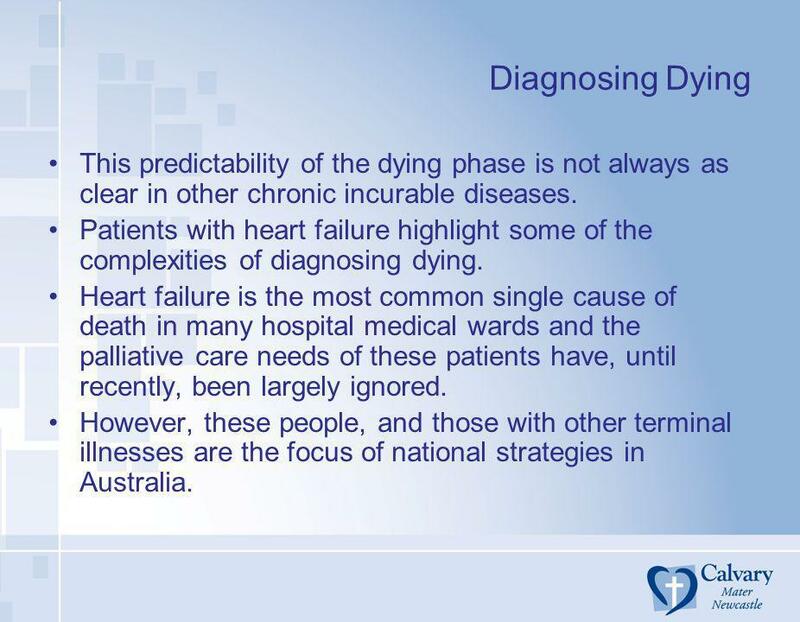 5 Diagnosing Dying This predictability of the dying phase is not always as clear in other chronic incurable diseases. Patients with heart failure highlight some of the complexities of diagnosing dying. Heart failure is the most common single cause of death in many hospital medical wards and the palliative care needs of these patients have, until recently, been largely ignored. However, these people, and those with other terminal illnesses are the focus of national strategies in Australia. 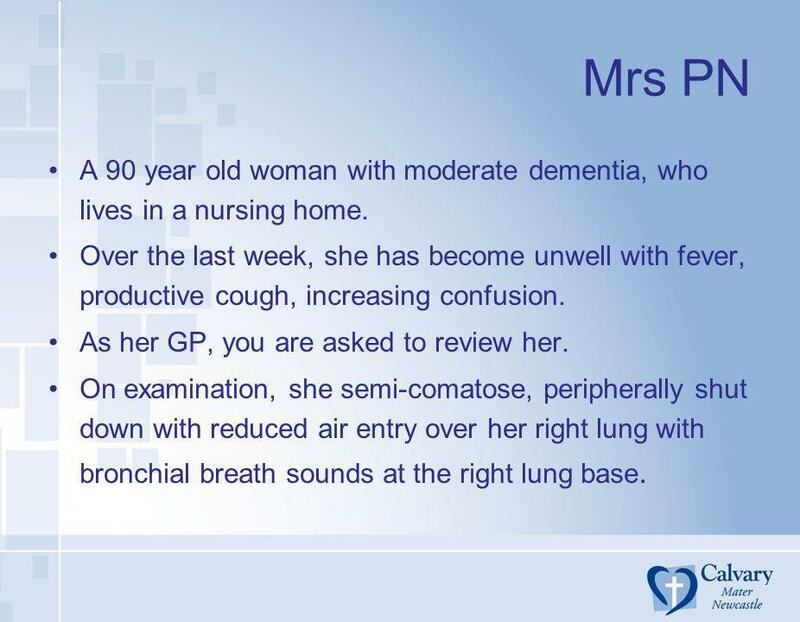 7 Mrs PN A 90 year old woman with moderate dementia, who lives in a nursing home. Over the last week, she has become unwell with fever, productive cough, increasing confusion. As her GP, you are asked to review her. On examination, she semi-comatose, peripherally shut down with reduced air entry over her right lung with bronchial breath sounds at the right lung base. 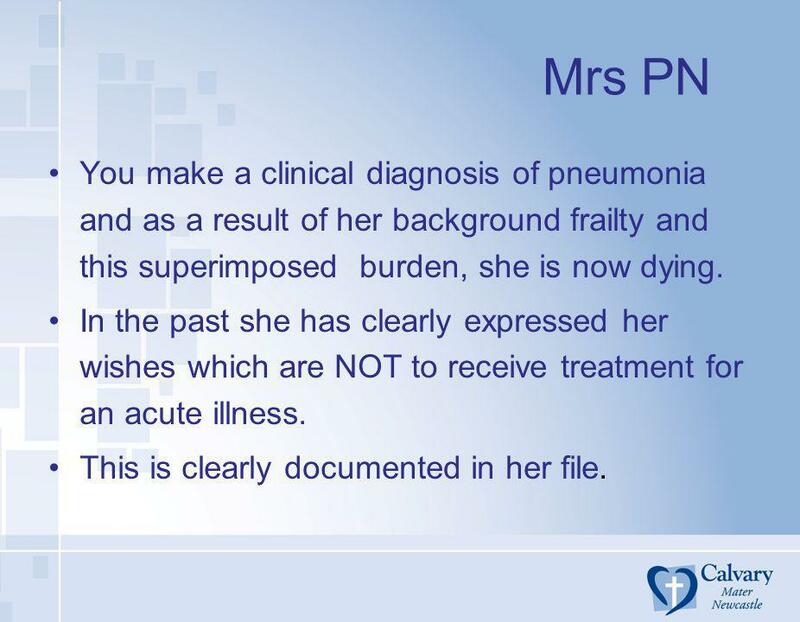 8 Mrs PN You make a clinical diagnosis of pneumonia and as a result of her background frailty and this superimposed burden, she is now dying. In the past she has clearly expressed her wishes which are NOT to receive treatment for an acute illness. This is clearly documented in her file. 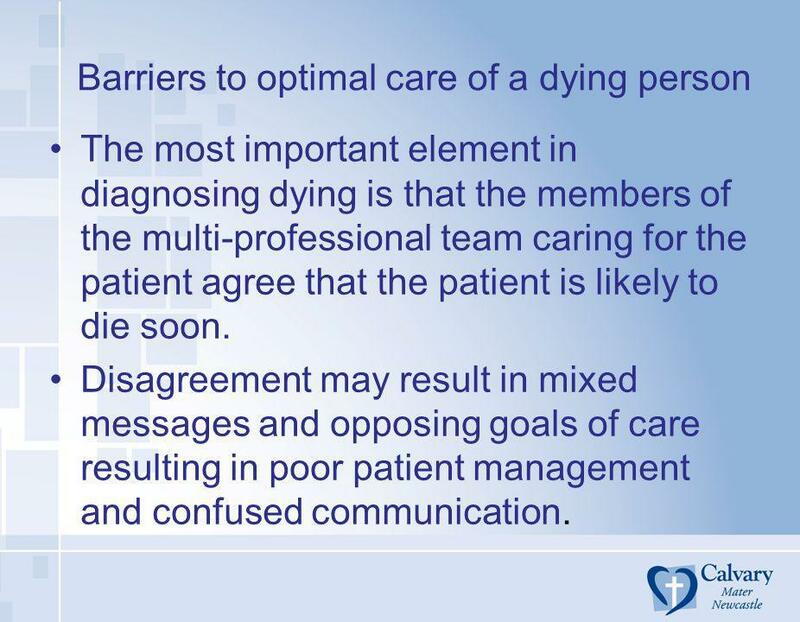 The most important element in diagnosing dying is that the members of the multi-professional team caring for the patient agree that the patient is likely to die soon. Disagreement may result in mixed messages and opposing goals of care resulting in poor patient management and confused communication. 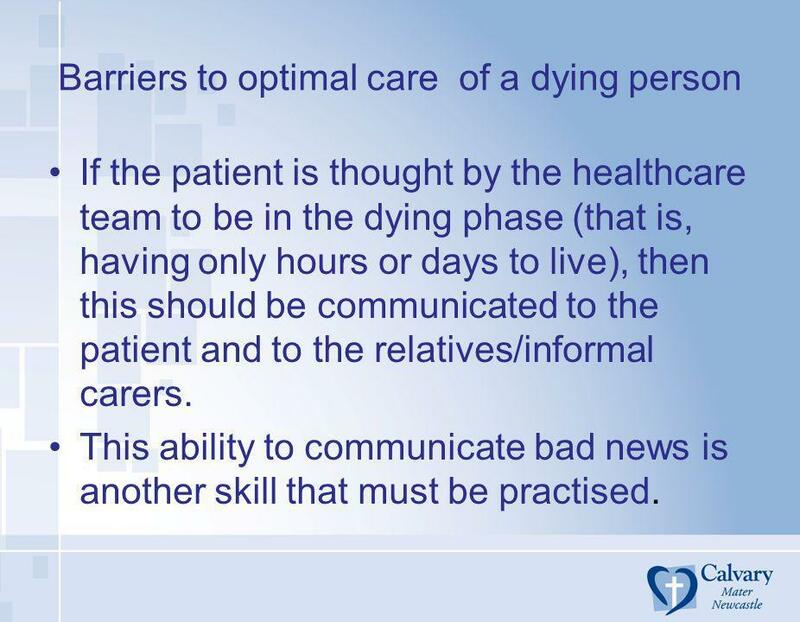 If the patient is thought by the healthcare team to be in the dying phase (that is, having only hours or days to live), then this should be communicated to the patient and to the relatives/informal carers. This ability to communicate bad news is another skill that must be practised. Broadly defined, bad news is any information that negatively alters a person's expectation about the present and the future. Importantly, news is defined as bad based on the recipient’s perspective about the information. 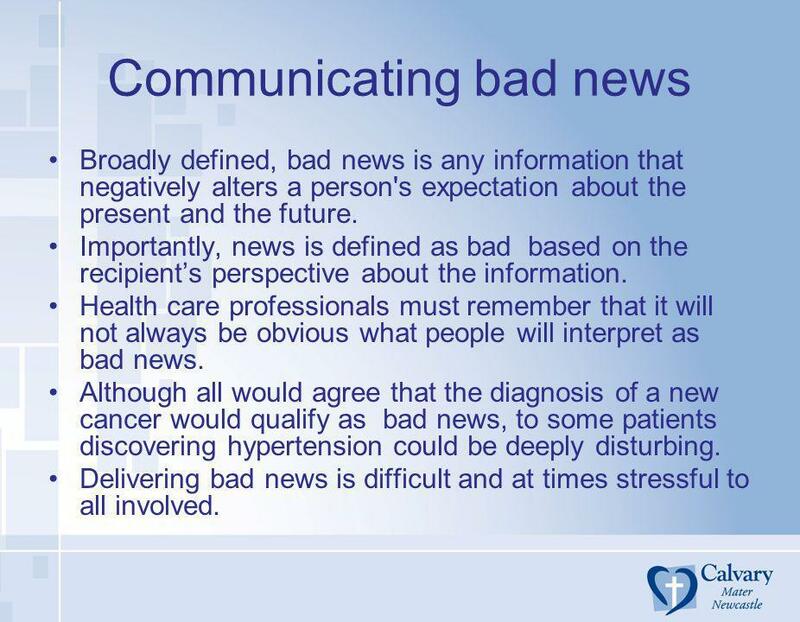 Health care professionals must remember that it will not always be obvious what people will interpret as bad news. Although all would agree that the diagnosis of a new cancer would qualify as bad news, to some patients discovering hypertension could be deeply disturbing. Delivering bad news is difficult and at times stressful to all involved. 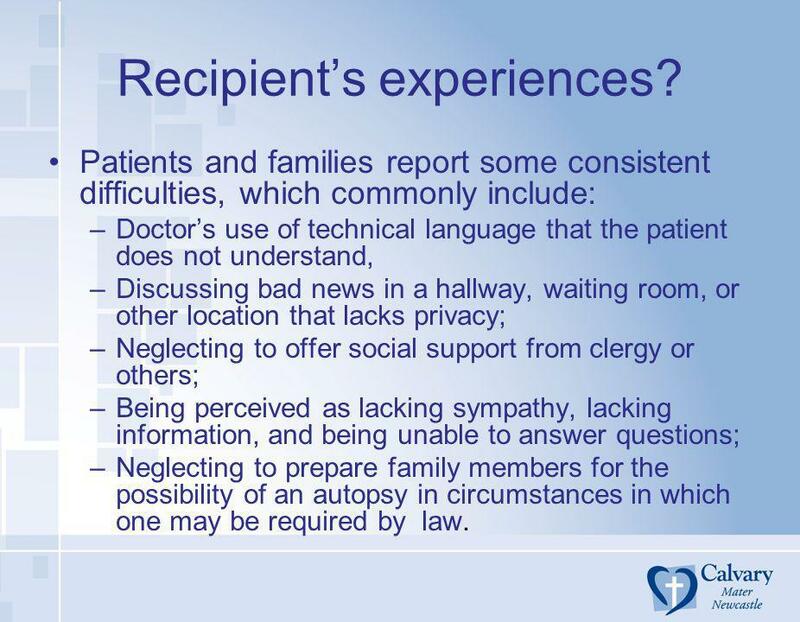 Patients and families report some consistent difficulties, which commonly include: Doctor’s use of technical language that the patient does not understand, Discussing bad news in a hallway, waiting room, or other location that lacks privacy; Neglecting to offer social support from clergy or others; Being perceived as lacking sympathy, lacking information, and being unable to answer questions; Neglecting to prepare family members for the possibility of an autopsy in circumstances in which one may be required by law. 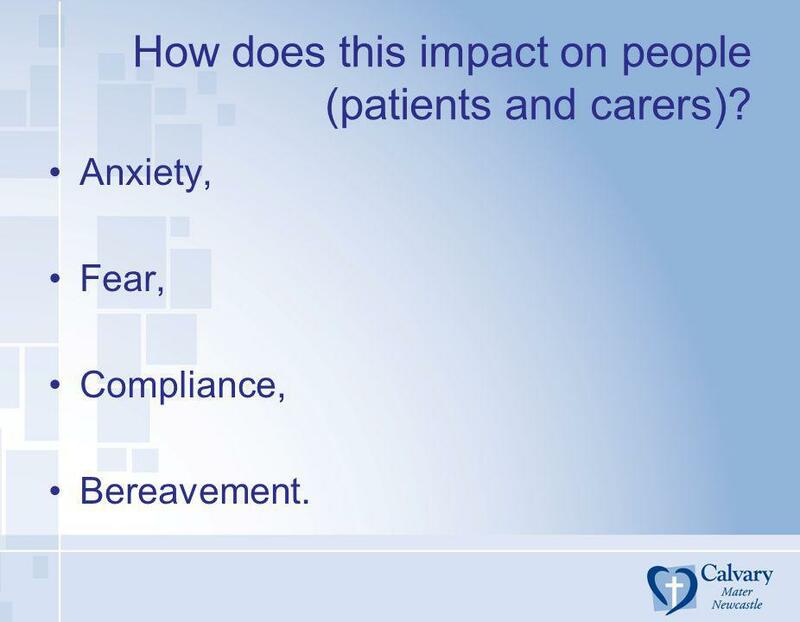 13 How does this impact on people (patients and carers)? 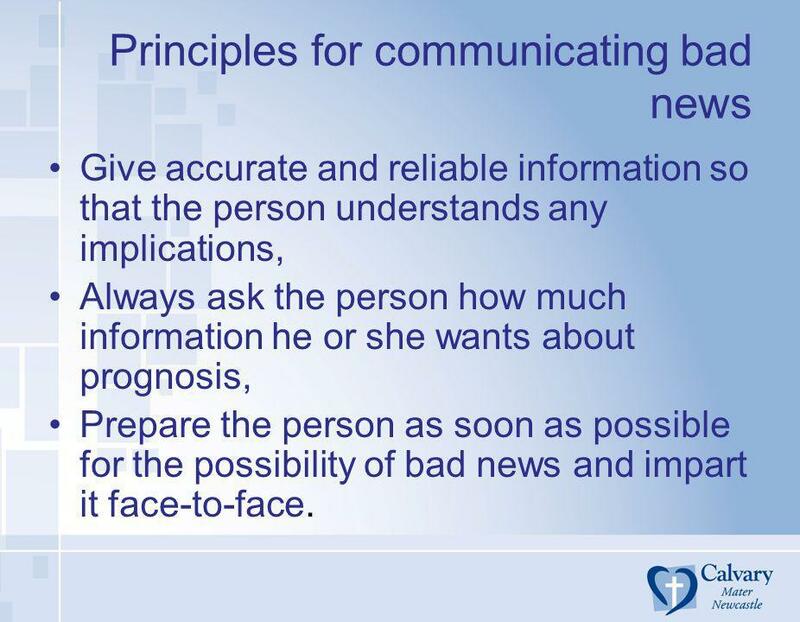 Give accurate and reliable information so that the person understands any implications, Always ask the person how much information he or she wants about prognosis, Prepare the person as soon as possible for the possibility of bad news and impart it face-to-face. 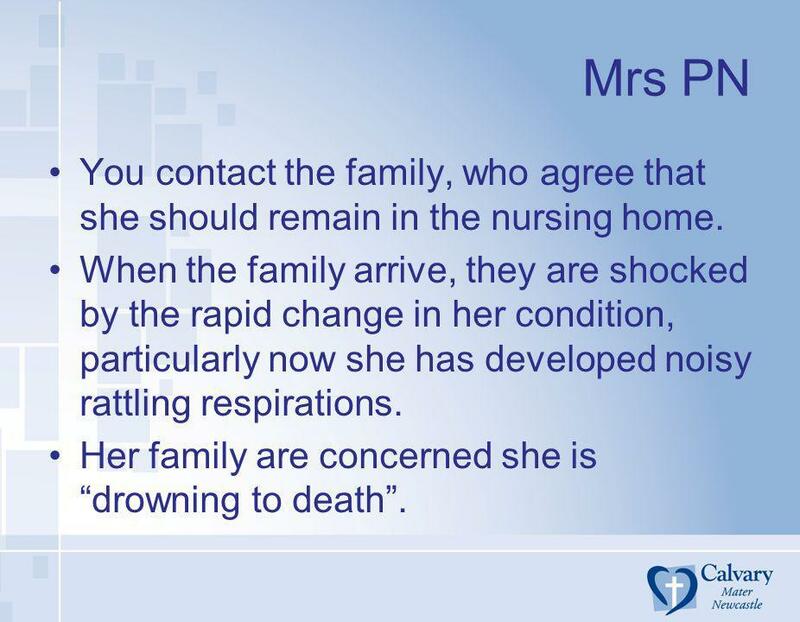 15 Mrs PN You contact the family, who agree that she should remain in the nursing home. When the family arrive, they are shocked by the rapid change in her condition, particularly now she has developed noisy rattling respirations. Her family are concerned she is “drowning to death”. 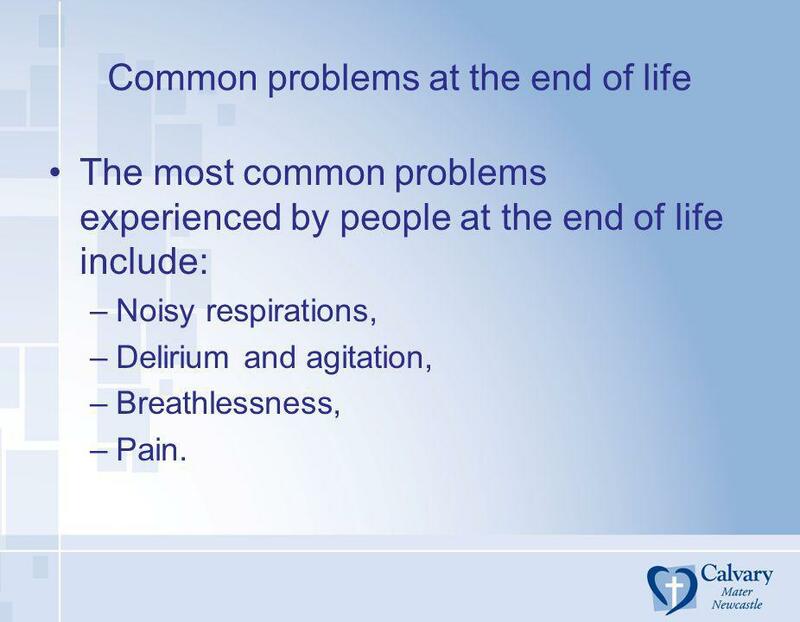 The most common problems experienced by people at the end of life include: Noisy respirations, Delirium and agitation, Breathlessness, Pain. 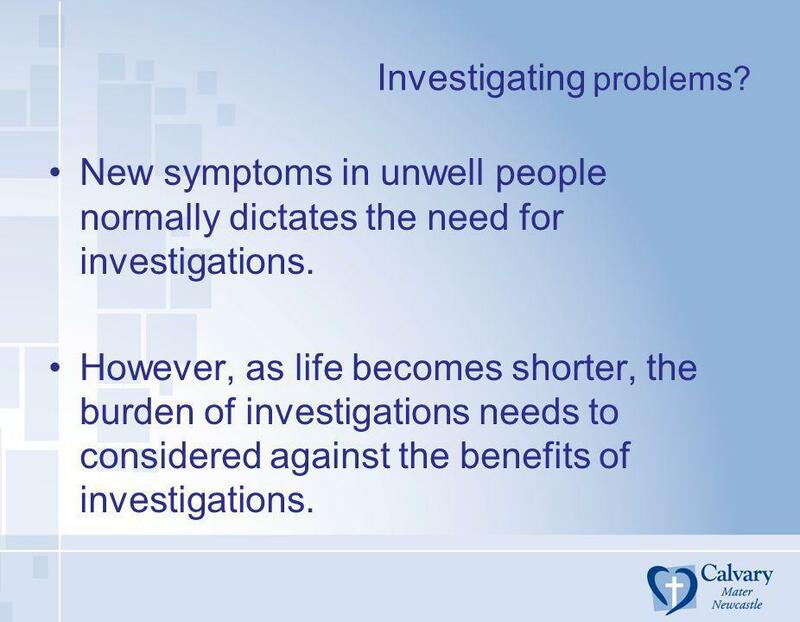 New symptoms in unwell people normally dictates the need for investigations. However, as life becomes shorter, the burden of investigations needs to considered against the benefits of investigations. 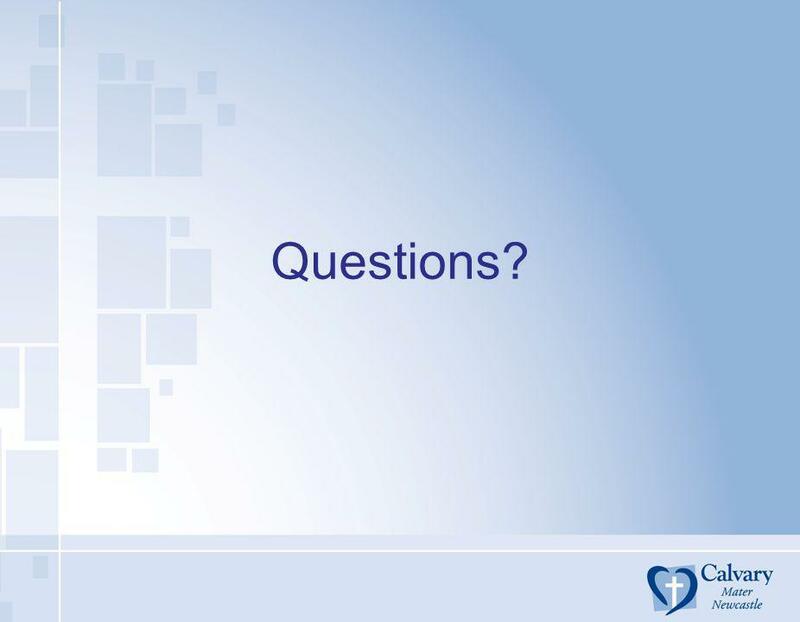 When a new symptom occurs, the following points must be considered: What is the person’s life expectancy? Does this new problem change this person’s outlook? What is the most likely cause? Can this be modified? 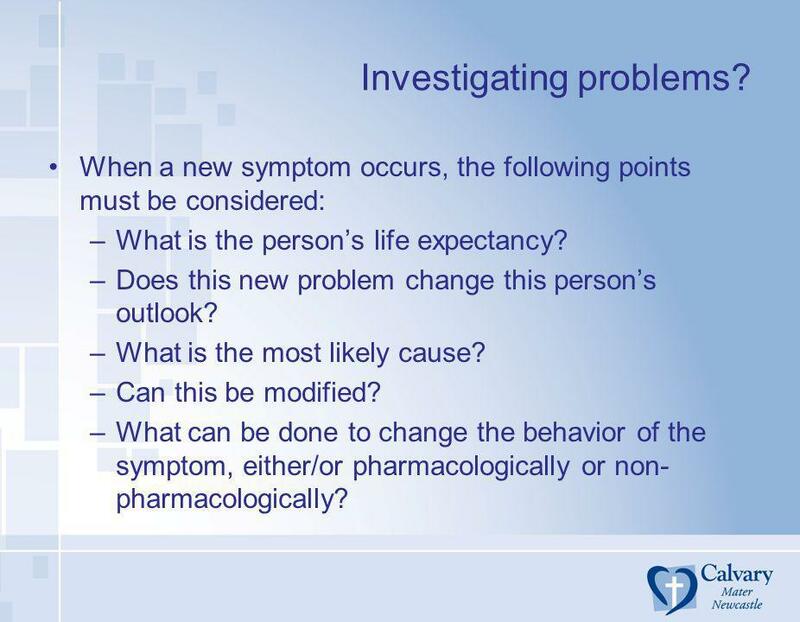 What can be done to change the behavior of the symptom, either/or pharmacologically or non-pharmacologically? Fluctuating disturbance in consciousness, Changes in cognition, Evolution of changes over a short period, Evidence that this is the result of an underlying medical condition. 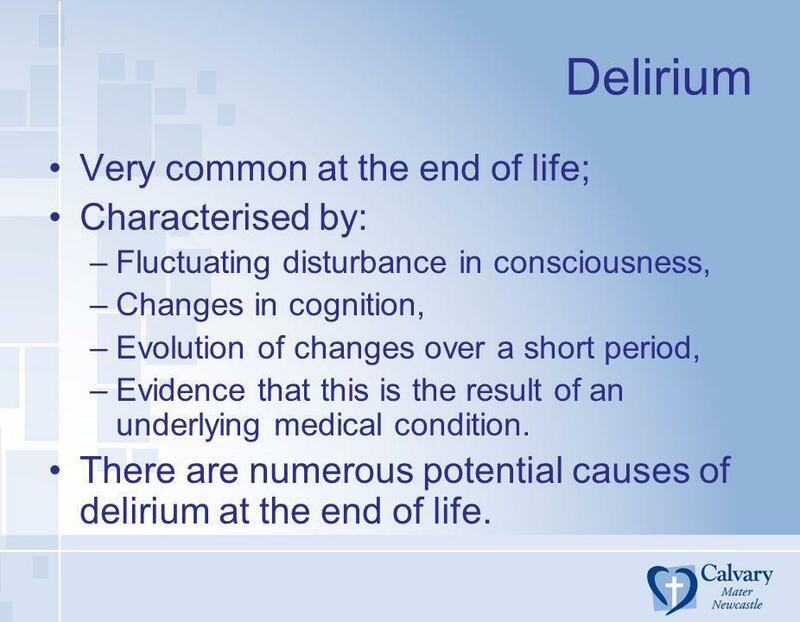 There are numerous potential causes of delirium at the end of life. 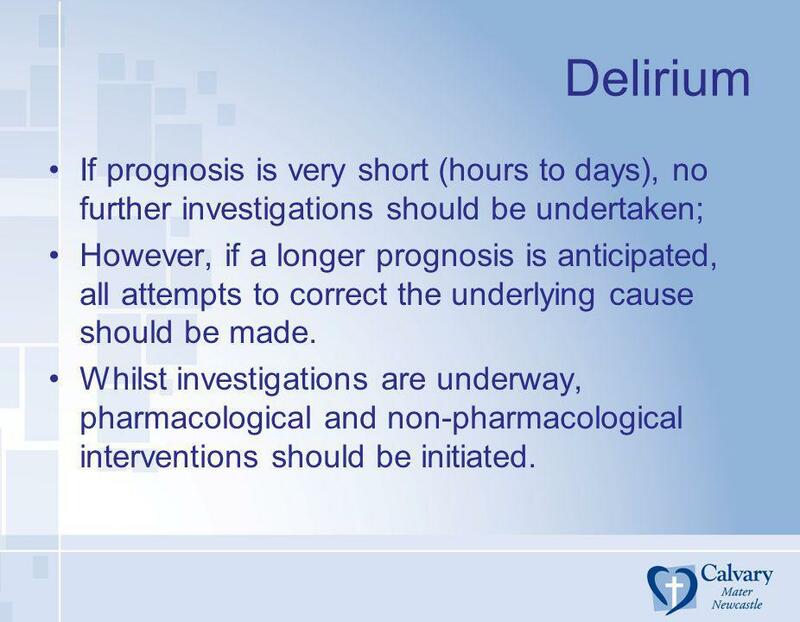 20 Delirium If prognosis is very short (hours to days), no further investigations should be undertaken; However, if a longer prognosis is anticipated, all attempts to correct the underlying cause should be made. Whilst investigations are underway, pharmacological and non-pharmacological interventions should be initiated. 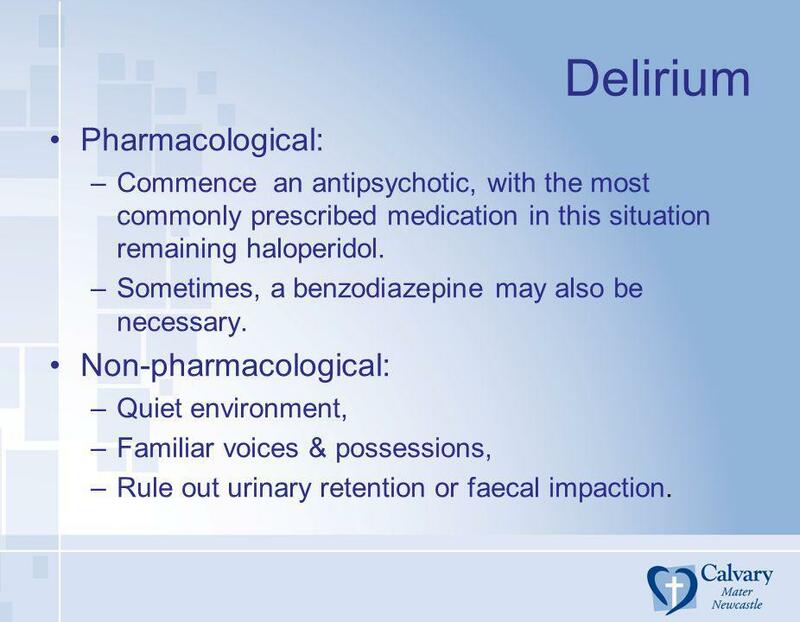 Commence an antipsychotic, with the most commonly prescribed medication in this situation remaining haloperidol. Sometimes, a benzodiazepine may also be necessary. 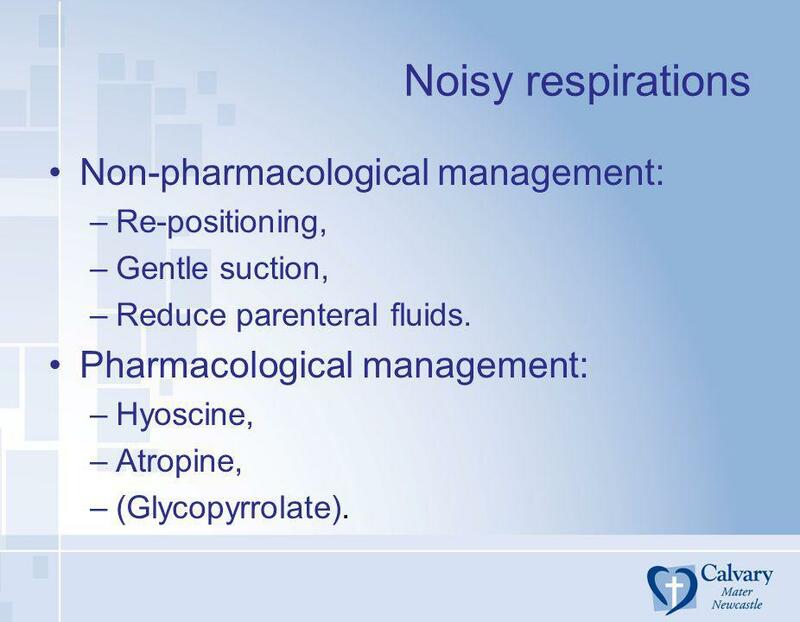 Non-pharmacological: Quiet environment, Familiar voices & possessions, Rule out urinary retention or faecal impaction. 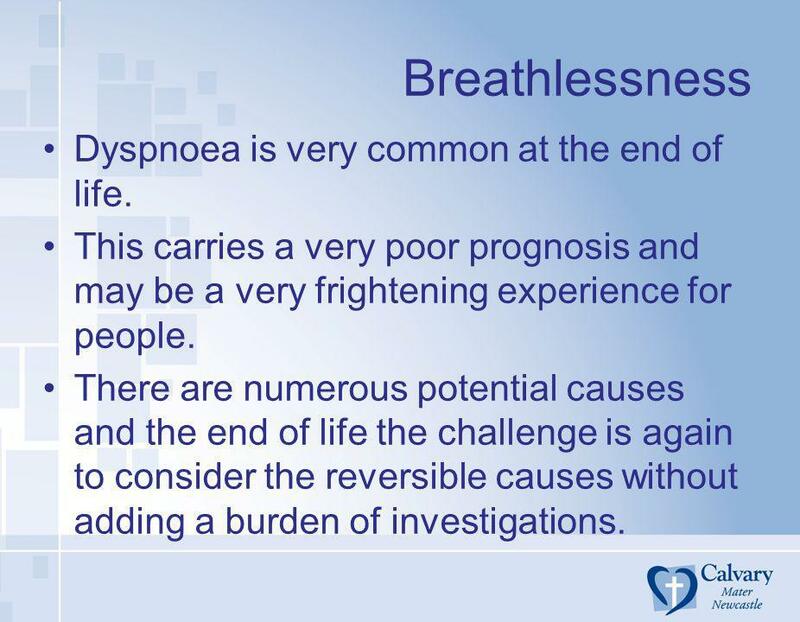 22 Breathlessness Dyspnoea is very common at the end of life. This carries a very poor prognosis and may be a very frightening experience for people. There are numerous potential causes and the end of life the challenge is again to consider the reversible causes without adding a burden of investigations. 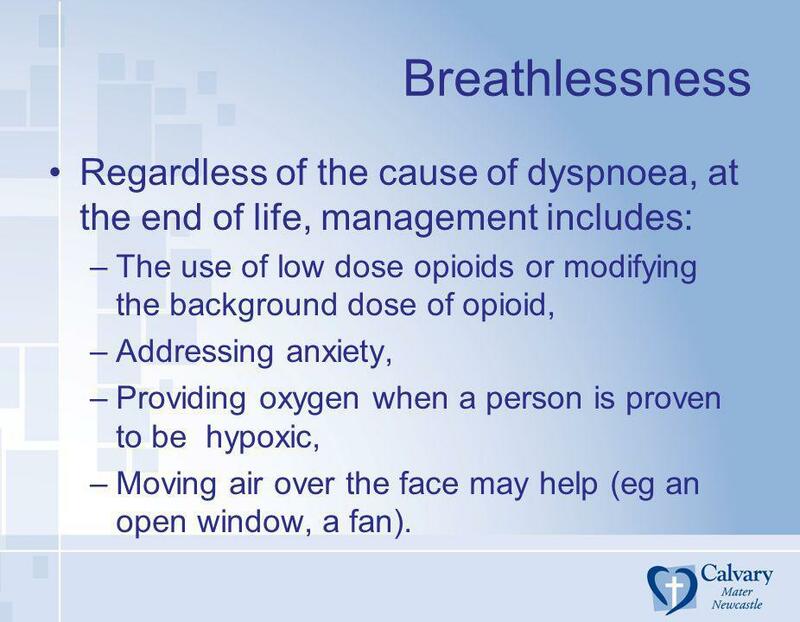 23 Breathlessness Regardless of the cause of dyspnoea, at the end of life, management includes: The use of low dose opioids or modifying the background dose of opioid, Addressing anxiety, Providing oxygen when a person is proven to be hypoxic, Moving air over the face may help (eg an open window, a fan). 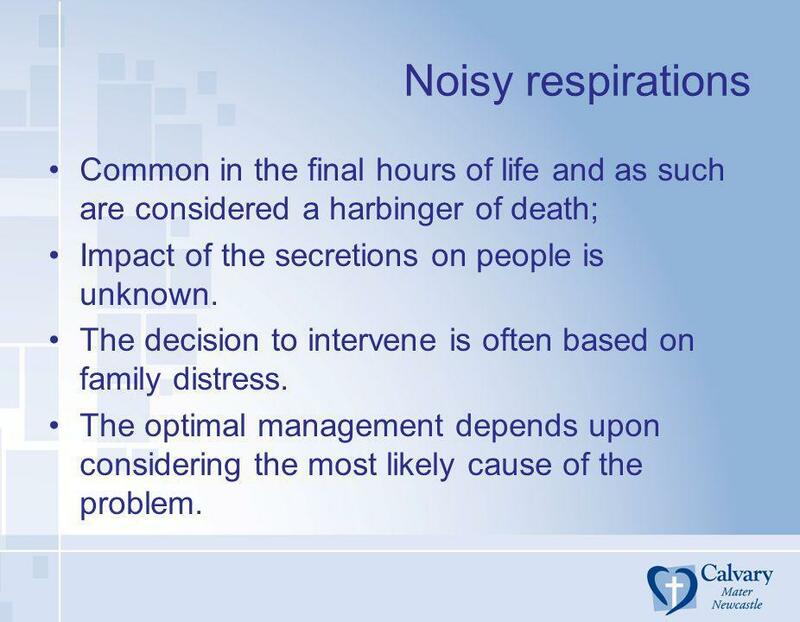 24 Noisy respirations Common in the final hours of life and as such are considered a harbinger of death; Impact of the secretions on people is unknown. The decision to intervene is often based on family distress. The optimal management depends upon considering the most likely cause of the problem. Re-positioning, Gentle suction, Reduce parenteral fluids. Pharmacological management: Hyoscine, Atropine, (Glycopyrrolate). 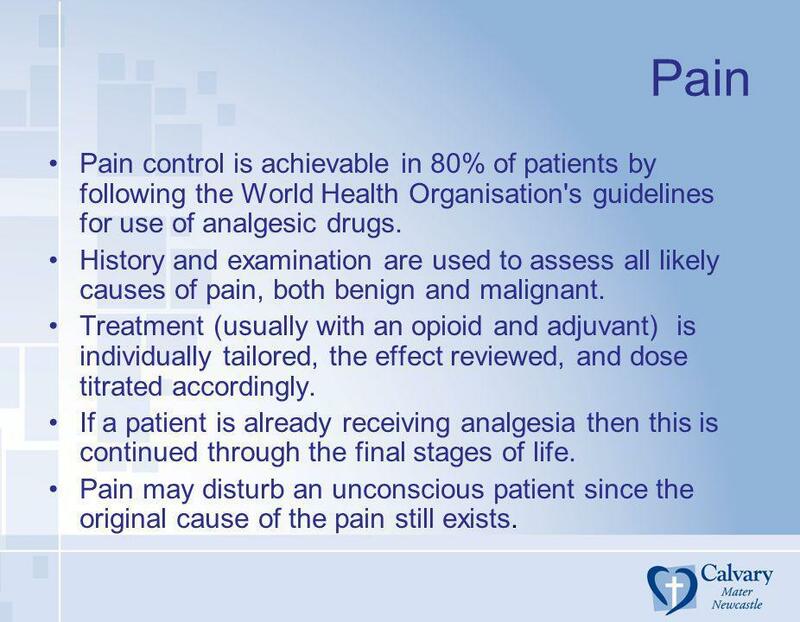 26 Pain Pain control is achievable in 80% of patients by following the World Health Organisation's guidelines for use of analgesic drugs. History and examination are used to assess all likely causes of pain, both benign and malignant. Treatment (usually with an opioid and adjuvant) is individually tailored, the effect reviewed, and dose titrated accordingly. 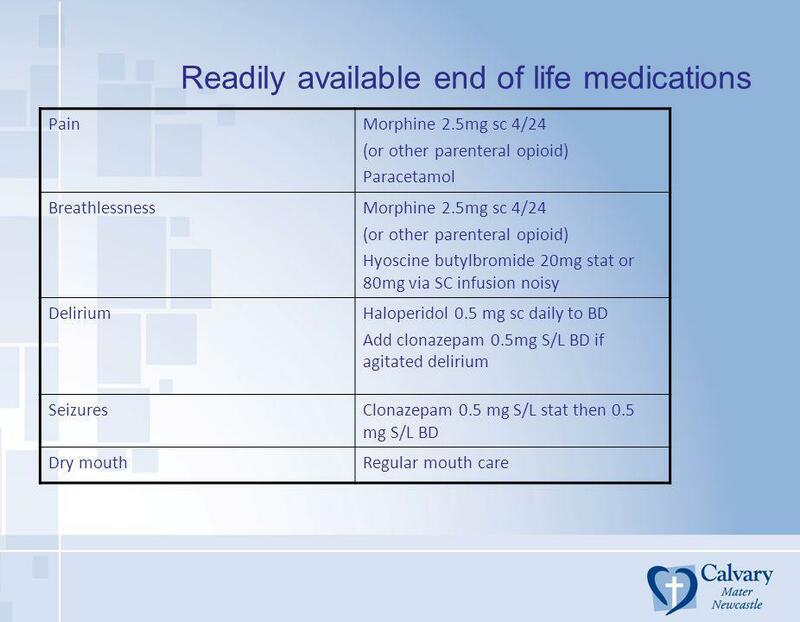 If a patient is already receiving analgesia then this is continued through the final stages of life. Pain may disturb an unconscious patient since the original cause of the pain still exists. 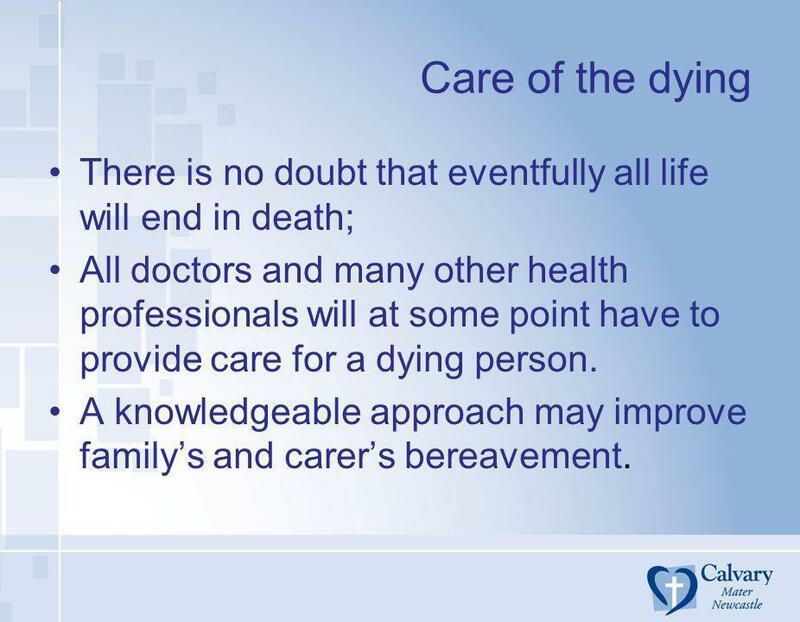 29 Care of the dying There is no doubt that eventfully all life will end in death; All doctors and many other health professionals will at some point have to provide care for a dying person. A knowledgeable approach may improve family’s and carer’s bereavement. 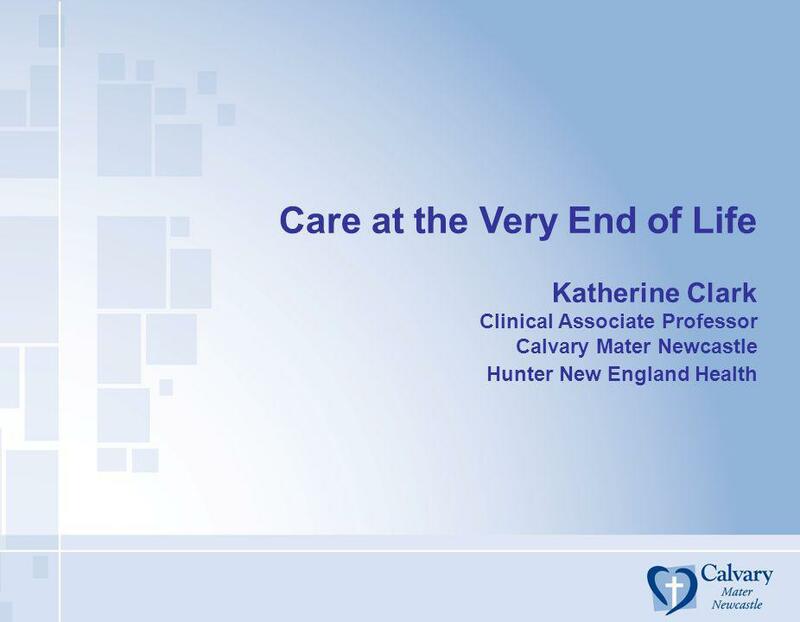 Download ppt "Care at the Very End of Life"
COMMUNICATING BAD NEWS: PATIENT AND FAMILY MEETINGS. Rapid Admission of Palliative Patients. Hospital Macmillan Specialist Palliative Care Nurse. Lung Cancer Specialist Palliative Care Nurse. September 2008. MACCABI HEALTHCARE SERVICES HOME CARE UNIT - DAN DISTRICT ISRAEL S. BERGER, M.D. & DORON GARFINKEL, M.D. THE RIGHT TO LIVE AND DIE WITH DIGNITY – AT HOME. Preparing for the Predictable Planning for common threats to comfort in the final days. Tamara Wells RN MN CNS Dr. M. Harlos Medical Director WRHA Palliative. 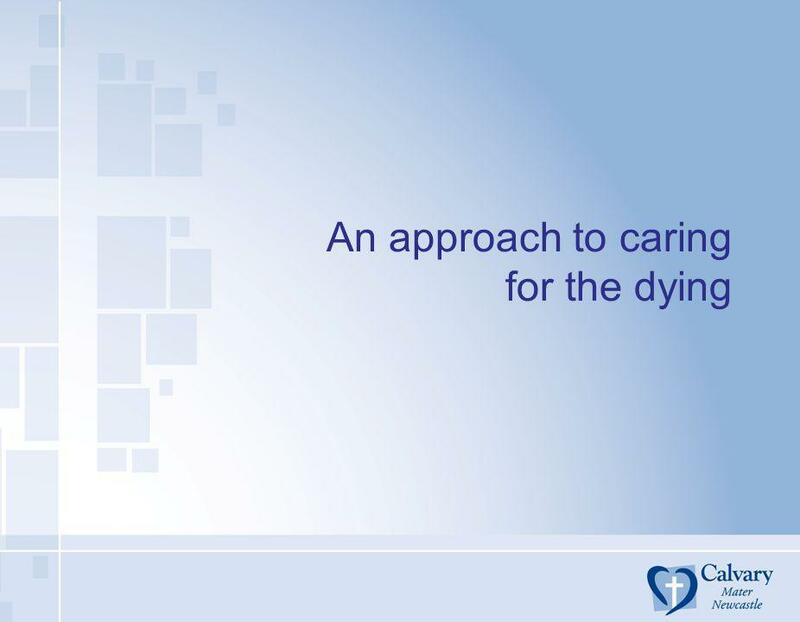 Caring for people who are dying Reflections on the Liverpool Care Pathway (LCP) A doctor’s perspective Dr Rosalie Dunn Macmillan Palliative Care GP Facilitator. Health Literacy in Palliative Care Tanja Bahro, Consortium Manager, Southern Metropolitan Region Palliative Care Consortium. Role of The Home Based Carer Paediatric Palliative Care for Home Based Carers Funded by British High Commission, Pretoria, Small Grant Scheme. Learning from the National Care of the Dying 2014 Audit Dr Bill Noble Medical Director, Marie Curie Cancer Care. Powys-wide, Primary care audit Rhiannon Davies, Powys tHB Medicines Management Team Prescribing of Antipsychotic Medication in Patients with Dementia. ACP Advance Care Planning Claud Regnard or Acutely Confused Plans? Palliative Care – update for the acute physician Dr Anne Goggin.